Vi har samlat och analyserat 15 experttester och 18 användarrecensioner från internationella webbplatser och tidskrifter. Experter ger denna produkt betyget 70/100 och användare ger den betyget 89/100. Genomsnittligt testdatum är 2017-05-23. Vi har jämfört dessa tester med 6376 tester från andra Drönare. alaScore™ för denna produkt är 90/100 = Utmärkt. Senast uppdaterad: 2019-04-25. The tiny, relatively affordable Yuneec Breeze places an emphasis on ease of use, but it isn't as capable as many other drones. Compact. Digitally stabilized 1080p video. Automated selfie shots. Customizable geofence. GPS with automated return-to-home. Sensor-stabilized indoor flight. Android and iOS support. Video feed lags behind reality. Kludgy phone controls. So-so video quality. 4K footage not stabilized. Remote control not included. Short operating range. Very limited battery life. An extravagance for sure, but this $500 flying selfie stick can grab some photos and have video ready to share with just a few taps. You'll need the digital image stabilization only available at 1080p and 720p resolutions. Image quality is OK, best suited for online sharing or viewing on a phone. Battery life is relatively short at 12 minutes. The little Yuneec Breeze 4K makes shooting and sharing aerial selfies a snap. But those looking to really pilot a drone should keep looking. 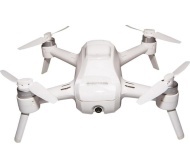 The is a small, portable drone that can effectively function as a selfie machine or a really cool toy for a young kid, but its lack of stability, cheap camera, and mediocre flight performance make it unsuitable for capturing high-quality aerial footage. The Yuneec Breeze 4K is a small and simple-to-fly drone that takes decent video, but it's worth spending a bit more to get better results.